Page, 40, opened fire outside the temple before entering around 10:30 a.m. Sunday morning and killed six people. He served in the Army from April 1992 through October 1998. Page was shot and killed in an exchange of gunfire with a police officer who sustained "eight or nine" gunshot wounds, authorities confirmed. Officials are treating it as a case of domestic terrorism. Though police have not given any details on the motive of the shooter, but Bureau of Alcohol, Tobacco, Firearms Special Agent Thomas Ahern said Page had tattoos that suggested he had ties to white supremacists. "It is being investigated. And what his tattoos signified is being investigated. They are all pieces of a possible puzzle to learn what was his motive in carrying out such a horrific act," Ahern said. Authorities also were trying to trace a single, semiautomatic handgun recovered at the scene, sources told ABC News. In addition to the seven confirmed dead, three people -- two adult male civilians and a male police officer -- were in critical condition and were being treated at a local hospital, said officials at Froedtert & The Medical College of Wisconsin. Page was shot and killed in an exchange of gunfire with the wounded police officer outside the temple and was one of the seven dead. "The officer stopped a tragic event that could've been a lot worse," Oak Creek Police Chief John Edwards told reporters. "The FBI is working closely with the Oak Creek Police Department and other local and federal agencies to investigate today's shooting incident," FBI Milwaukee Special Agent in Charge Teresa Carlson said in a written statement. "This remains an active investigation in its early stages. While the FBI is investigating whether this matter might be an act of domestic terrorism, no motive has been determined at this time. We know our community has been deeply impacted by this incident, and our thoughts are with those affected and particularly with the officer who was wounded in the line of duty to protect others." The president of the temple, Satwant Singh Kaleka, was preparing to deliver remarks when he became one of the shooting victims. His son, Amardeep Kaleka, spoke by phone with ABC News' David Muir shortly after getting a call from the priest using his father's phone. Edwards said 911 calls began pouring into the police department around 10:25 a.m. The first police officer to respond to the scene, a 20-year veteran on the police force, exchanged gunfire with the suspect and sustained multiple gunshot wounds. He underwent surgery at Froedtert Hospital, the main trauma center in the Milwaukee region, along with two other injured victims. According to information broadcast over police radio, a witness to the shooting told law enforcement the shooter was a white male, bald, with a heavy build. Police tactical teams spent more than four hours securing the temple and, at one point, police asked media outlets to stop broadcasting aerial footage from helicopters on television because of tactical operations at the scene. 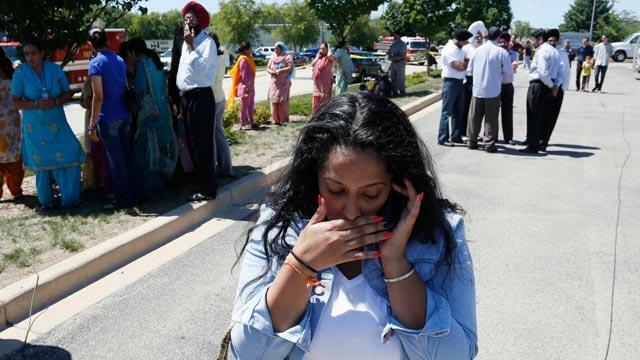 "Every single member of my family was inside that church," Simran Kaleka said. "No matter who is shot and killed in there, it's going to affect all of us out here because a lot of people are related here. And it's just, for me, my life flashed before my eyes because it's my whole family."